VAdm Ibok-Ete Ekwe Ibas held discussions with RAdm Shekhar Mital, NM, IN (Retd), CMD. Goa: VAdm Ibok-Ete Ekwe Ibas, Chief of the Naval Staff, Nigerian Navy visited Goa Shipyard Ltd on today. During the visit, VAdm Ibok-Ete Ekwe Ibas held discussions with RAdm Shekhar Mital, NM, IN (Retd), CMD on various issues of cooperation. VAdm Ibok-Ete Ekwe Ibas was conducted around the shipyard by CMD GSL and was shown the ongoing shipbuilding activities & Modernization of the Yard. 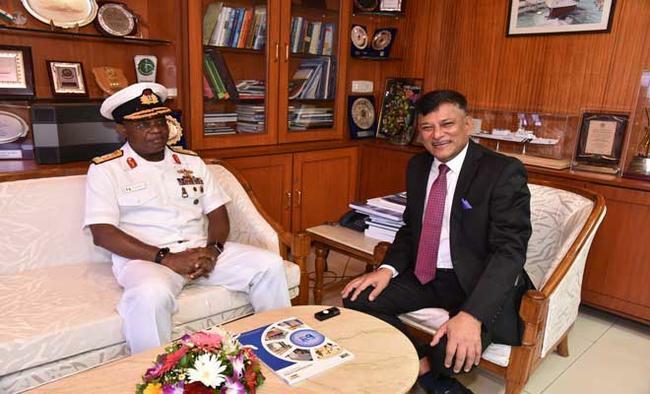 Admiral took keen interest in the ongoing construction of Coast guard OPVs being built by GSL. The Chief of the Naval Staff was impressed with the Shipyard’s infrastructure and the excellent quality of workmanship. Earlier a presentation was made to the CNS, Nigerian Navy on in-house design capability, product profile and future potential of cooperation. The Admiral was briefed on the GSL offer for 02 LSTs (Landing Ship Tanks), for which GSL is under consideration for award of order under global tender. Detailed discussions were also held on various other projects where two organizations can work together. CNS appreciated GSL for its outstanding execution track record of delivery of 24 projects all ahead of schedule in last four years and the technological innovations on the ships under construction. He appreciated design capabilities of shipyard and expressed keen interest of enhancing interaction with GSL, going forward.